I have a setup where two game objects in different positions in the hierarchy are supposed to be clamped together so that they move as a unit. Essentially the idea is that props underneath the joined game object will appear to be in the character's hand. But for IK-related reasons, we can't just position things sensibly in the hierarchy, either because IK is broken or something about how VRChat is using it is broken. The problem is that the prop wobbles a lot, and is more like holding a rubber banana than holding a weapon. There are other posts here with the same kind of question, but the solutions mostly couldn't be used. 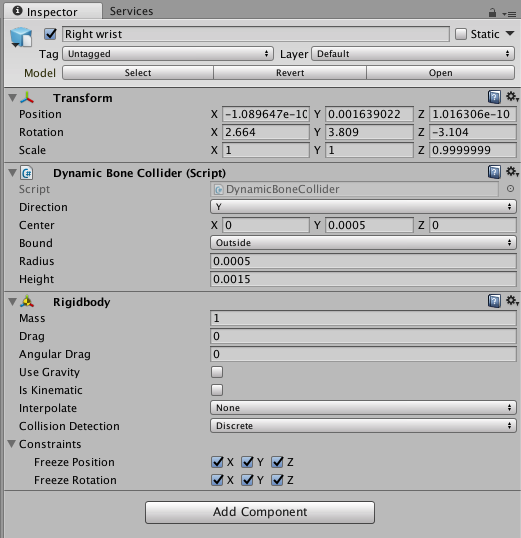 I can't replace the physics engine, or the particle engine, because I'm ultimately just making a plugin. I can't position the game object directly under the wrist because of IK issues already mentioned. And I can't run custom scripts, because the platform does not permit it. I understand that Fixed Joint is implemented as something like a stiff spring, but it obviously just isn't anywhere near stiff enough. I thought that maybe Configurable Joint could be used, if only I could figure out how to get it to work. I tried various combinations of settings, but ended up with either the same result, or the prop not even moving into the right position. 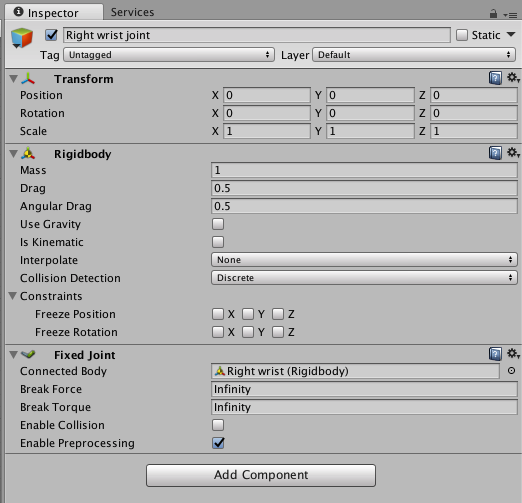 So I guess the sub-question is: What settings on Configurable Joint correspond to the normal behaviour of Fixed Joint? I assume there will be a non-zero parameter somewhere which would correspond to the stiffness, which I could then tweak? I also have a last resort workaround in mind, whereby I put the physical part of the object directly under Wrist, but then put the particle system under the joint, so that I can still work around the particle system issue while the item itself won't be wobbly. It won't be a satisfying fix, though, because I won't be able to group the two items together as a reusable prefab, so I'm leaving it as an absolute last resort. I can't run custom scripts, because the platform does not permit it. So you are not allowed to write any code at all on this platform? Are you sure? Whitelisted scripts can be run, but scripts we write ourselves almost certainly would never get whitelisted.